It seems that Salted Caramel is one trend that is going nowhere! I’m quite pleased about that. It has so many delightful uses. Pour it over ice-cream, apple crumble, or pancakes. Use it to fill donuts, eclairs or sandwich your cookies or cakes together. 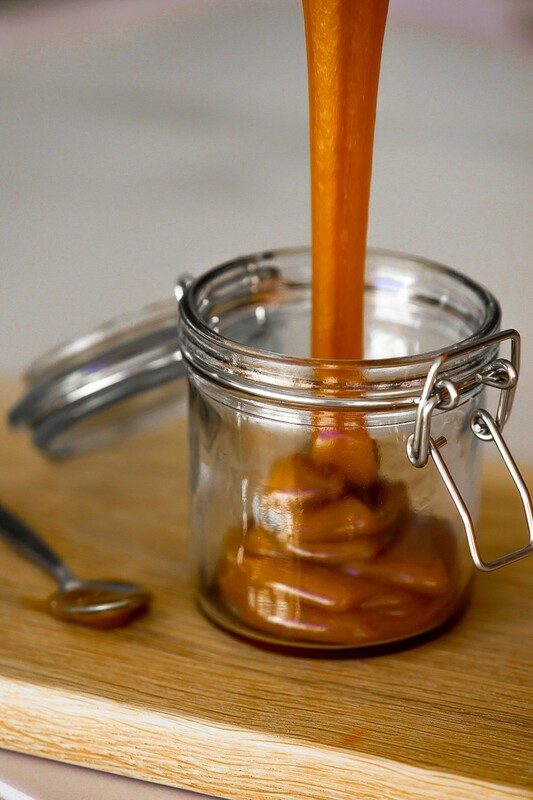 As you can see, it is simply essential to have a go-to Salted Caramel sauce recipe. You may be surprised by how easy the recipe actually is. A sugar thermometer is not essential, but patience definitely is! Once your syrup is boiling it takes a good 15 minutes to turn a nice amber colour, and in this time I strongly advise you not to step away from the bubbling pot. The moment you add your cream is really the make or break for this recipe. The cold cream stops the very hot caramel from cooking. If the syrup is not quite dark enough at this point, it will result in a light sauce that is lacking in caramel flavour. If its too dark, rather start again than waste your cream as it will be bitter. Place the sugar and water in a heavy bottomed saucepan over low heat. Cook without stirring until sugar dissolves. Use a wet pastry brush to wash down any sugar crystals from the sides of the pan. This prevents the sauce from crystallising. 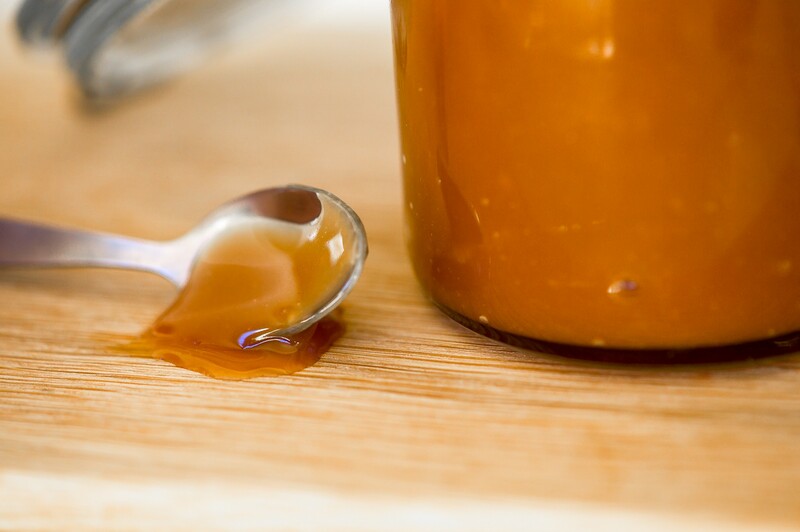 Increase the heat to medium-high and continue cooking until the syrup turns a caramel colour (this requires some patience, but keep watching it – after ages of no change in colour it all of a sudden turns!). If you have a sugar thermometer this is at around 174°C. Remove the pan from the heat and quickly stir in the cream. It will bubble up! Cook for another 1 or 2 minutes stirring constantly with a wooden spoon until smooth. Remove from heat and add butter, vanilla extract and salt. Stir well until smooth. Allow to cool for 10 minutes. The sauce can be refrigerated in a jar and gently warmed in a bowl of warm water before serving.